Overtaxed and underrecognized, the humble honeybee finally gets her due. . .
Now disappearing in alarming numbers, honeybees are the unsung heroes of the food chain, essential for the pollination of apples, oranges, almonds, blueberries, and more than ninety other crops. CATCH THE BUZZ! Beekeeper and author Susan Brackney invites you to step inside the mysterious world of the honeybee. 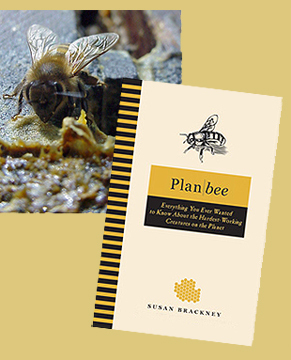 Look for Plan Bee: Everything You Ever Wanted to Know About the Hardest-Working Creatures on the Planet from Perigee Books.